Book Review: 'The City In The Middle Of The Night,' By Charlie Jane Anders Charlie Jane Anders' new novel, set on an inhospitable alien planet, is about rebels, smugglers and lobster-like monsters, but also about how grand political ideas break down — and who that hurts. "'The founders of that city had a valid theory of human nature, but they took it too far. That's the problem with grand social ideas in general, they break if you put too much weight on them.'" In every book, there is a moment. A point at which the writer must lay out, in plain terms, their central argument. It doesn't matter where it happens, only that it does. It is the place where the main character(s) realize the stakes, understand the cost, see — even if only briefly — the future. No matter where it comes, it is the middle of the story: it's geographic center. Everything before it will be prologue. Everything after, the result. 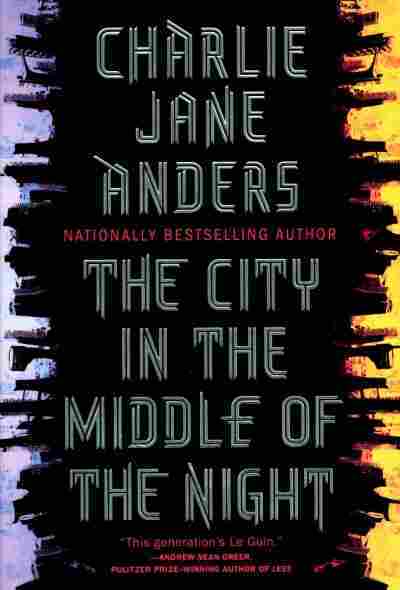 In The City In The Middle Of The Night, Charlie Jane Anders places her argument on page 212, halfway down the page, in the middle of a moment of tumult, in the process of meeting a new character. "Grand social ideas ... break if you put too much weight on them." Here's where we're at: The planet January, a tidally-locked body far from earth. One side faces the sun and is a hell that'll melt you with its heat. The other faces deep space. It'll freeze you with its darkness. Humans came here long ago, after some fairly loosely understood ecological catastrophe, and chose (rather inexplicably) this openly hostile world to settle — a place where they could only exist in the narrow margins between daylight and darkness. They built two great cities, Xiosphant and Argelo. In the first, life is ordered, regimented, lived by the tick and tock of an artificial time system to compensate for the lack of a traditional day/night cycle. The language, the economy, the politics — everything has been molded by an order to assimilate and thrive in this alien place, warped by the lack of a natural system, frayed by the slow breaking-down of all the technology that came with them from Earth. The second, Argelo, is the opposite. It is anarchic, libertine, run by constantly warring criminal gangs. There, you can do whatever you want. Problem is, so can everyone else. And yes, I get it. This all sounds YA-simple, doesn't it? The people may as well all be wearing special colors or badges to denote their specific caste, just so we know who to root for when the plucky female heroine convinces them to rise up in rebellion. But stick with me a minute because there's more here. Lots (and lots) more. In the beginning there is Sophie who loves Bianca and Bianca who also loves Bianca. Sophie, a poor kid from the dark side of Xiosphant, who brute-forced her way into the fancy-pants university that Bianca (rich girl, privileged, gorgeous, horrible in a way that will haunt you by the end) was pretty much born to. Bianca likes playing revolutionary. Likes shouting about justice and rebellion between glittering parties and balls. Sophie, naturally, plays along, But one day, Bianca essentially steals three dollars from a cash register to buy drinks for her fellow trust-fund Che Guevaras. The cops get involved. Sophie takes the rap for her — not wanting to see her friend's beautiful life spoiled. And so the police kill her. Or try to. They perform what amounts to an extra-judicial banishment, tossing Sophie outside the city walls to die amid the cold and the crocodiles. Did I not mention the crocodiles? Oh, you're gonna love this. Before the humans came, January already had a native species. The crocodiles (who Sophie later names the Gelet) are intelligent, cultured, advanced. They communicate telepathically, by touch and scent, share all memories of everything ever, and have an enormous city in the middle of the planet's dark side. The humans, of course, hate them because they look like giant furry ice lobsters. So they hunt them, kill them, sometimes eat them. Because people, right? We're just the worst. [City] is a story about how grand social ideas break, and who gets hurt worst in the breaking. Except, okay, yeah. We kinda are. And that's where Anders goes here, because The City is basically a story about exactly that worst-ness. All of it. It is almost a fable with its talking animals. Basically a no-holds-barred poli-sci debate held between earnest sophomores, but dressed up in the drag of a scifi novel. It is a story about how grand social ideas break, and who gets hurt worst in the breaking. A story of memory, family, lineage, class and revolution (and giant ice lobsters) where the vast majority of the action is emotional, relational. And yes, there is adventure and action. I mean, this is a book with spaceships, pirates, smugglers, rebels, rich girls and alien lobster monsters. And Charlie Jane knows how to tell those stories, for sure. But it is more than that, is what I'm saying. It is an intimate portrait of people as much as it is a piece of culturally aware social scifi — a look at our moment in history through a distorting lens of aliens and spaceships. And it is those people who break everything that lies broken by the end of things; who are the living, breathing foci of the "valid theor[ies] of human nature" being discussed, and the eyes through which we will see the beginnings, the fiery middles and the cold, dark ends of things before we are through.